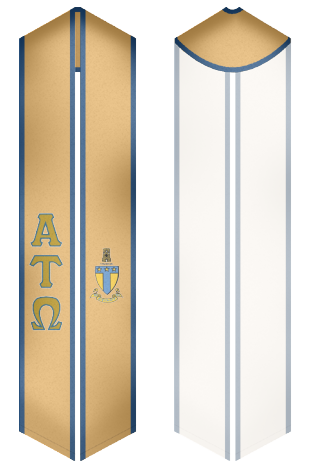 Custom Sash Amazing graduation stoles and sashes for Alpha Tau Omega. Alpha Tau Omega was formed at Virginia Military Institute in 1865 and is a leadership and social fraternity. It has over 200,000 members and 140 active chapters. This the first social fraternity to be considered a national fraternity. With many famous alumni, being part of this fraternity is something to be proud of. Buy your custom sash today and enjoy being part of such a great organization.